In June last year I found myself in Perm, “the easternmost city of Europe”. The little I knew about the place was that it was the center of the Perm region; that it had a population of about 1 million people; that it had a long tradition of heavy industry and armaments manufacture, which in recent years had been rapidly declining; that one of the few flourishing industries was the local branch of the Lukoil company; that the city was situated on the river Kama on the western side of the Urals; and that, after the end of communism, the city had started to shrink. Vague reports had reached me that something interesting had been happening there in culture in the last few years, but I admit that I had kept my expectations low. I thought I knew how cultural innovation spreads in Russia: you have the cosmopolitan capital city, with a well developed, innovative and diverse art scene, a great many exciting private art institutions and a dense cultural offer, while in the province that cultural offer is limited to the traditional cultural institutions – the theatre, the museum, the philharmonic. Moscow is different: many interesting developments have mushroomed there in the last decade: new artistic clusters like “Art-Play” (today “Manometr”), The Center for Contemporary Art “Vinzavod”, the Center for Contemporary Culture “Garaj”, the project “Fabrika”, “Art-Strelka”, as well as the State Center for Contemporary Art – to name just the most visible initiatives – have transformed the cultural scene and created a new audience with a taste for contemporary art. Private initiatives like these became the pillars of a vivid contemporary artistic life in Moscow, significantly enriching the contemporary cultural offer in the capital. But Moscow, I knew, also remained by and large an exception in Russia: a world metropolis that creates conditions for a vivid contemporary cultural scene, but whose path could hardly be replicated in other Russian cities… Or such was my outsider’s view, at least. And here comes my discovery of “the Perm exception”. In 2008 the government of the Perm region started to invest significant resources in a variety of contemporary artistic expressions, in transforming the public space through contemporary art, and in branding the city through cutting-edge creativity. The contemporary “cultural revolution” that I discovered taking place in Perm was exceptional in several ways. Firstly, the very fact that contemporary culture is strategically and consistently supported by the governor’s office was a precedent in the Russian context; secondly, investment in contemporary art was seen by the regional government as a way to develop the region, to attract new businesses, to stop the brain drain, and to make people’s lives more interesting and colorful. In short, Perm has become a laboratory of how contemporary culture, when cleverly promoted, can produce social change, even far from Richard Florida’s San Francisco, Austin or Boston… How was this possible? In 2008 Marat Guelman – a gallery owner according to some, a “political technologist” according to others or, according to yet others, simply a perfect manipulator, benefitting hugely from his close relations to power – left his home in Moscow and his trendy contemporary art gallery (situated in the aforementioned cultural cluster “Vinzavod”), to move to Perm and establish a Museum of Contemporary Art. In September 2008, the first exhibition, “Russian Povera”, was opened in the building of the riverside station, which had been unused for years. This was the largest contemporary art show in the region in decades, presenting works by established contemporary Russian artists such as Nikolay Polissky, Olga and Alexander Florensky, Valery Koshlyakov, Dmitry Gutov, Anatoly Osmolovsky, Alexander Brodsky, Peter Belyi, and Vladimir Arkhipov. After the success of this exhibition, the establishment of a contemporary art museum was announced as a key initiative of the regional government, and the required funding for the reconstruction of the building as well as for the functioning of the museum was secured. The opening of the Museum was seen as a step towards a de-provincialization of cultural life in Perm: the city would now be able to compete with Paris and Berlin, who have also converted former railway stations into museums of contemporary art (Musée d’Orsay in Paris, Hamburger Bahnhof in Berlin). The museum has since arranged a series of impressive contemporary art exhibitions (http://www.permm.ru/menu/exhibitions.html). As I write, the exhibition “Fatherland” is running at the museum, where one can see an architectural ensemble of onion towers, made of jars and bottles, each tapped by a dome-like rubber enema; a three dimensional Russian coat of arms made of a stuffed, double-headed eagle; a patchwork map of Russia; a portrait of Putin as an action-hero, with a pistol – objects that provoked fierce debate, intense anti-Guelman activity on the Internet, allegations of anti-Russian sentiment, and so on. But what is interesting is that, unlike other similarly provocative exhibitions elsewhere in Russia that ended with vandalization by “patriotic organizations” (e.g. “Beware: Religion!” in 2003) and the prosecution of the artists, this exhibition is supported by the Perm government, which seems not to be ashamed of having funded it and certainly does not plan to arrest any of the artists involved. This is just one of the exhibitions in a regional, government-created Museum of Contemporary Art, a museum that wants to be seen as a space of freedom and that aims at keeping the debate on contemporary art alive among the people of Perm, making it part of their lives: a normal approach in the West, however something that is quite unique in the Russian cultural context. However Marat Guelman and his powerful patrons did not limit themselves to the creation of PERMM, the Museum of Contemporary Art. They also established a Center for the Development of Design (with the support of the economic development department of the Perm region), and offered the museum office space. In all he does in Perm, Guelman utilizes his almost 30 years of experience as a well-networked collector of contemporary art and gallery owner, thus succeeding in involving the best artists and art managers in the task of transforming the city into one of the most important sites in the Russian contemporary art scene. The Center for the Development of Design, for example, has employed some of the best designers in Russia, for example Artemij Lebedev, who became its director. The center is a key player in the “Perm cultural revolution”, which started on many fronts in 2009. The design center took on the task of transforming the public space and brand the city in a contemporary, attractive way. Two years later, Perm has the feel of a vibrant creative city. Marat Guelman with Victor Erofeev in front of the the Permian Gate, a monumental cyrillic P, sculpted by Nikolay Polissky. It is hard to list all the art works that people now see every day in Perm. 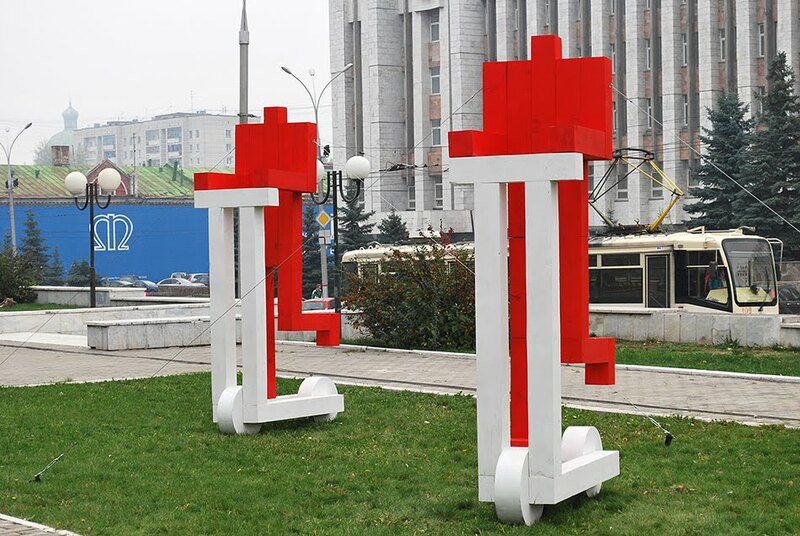 There are the “red people”, a constructivist design that has become the new symbol of Perm (today they can be bought as souvenirs in many shops); some carry slogans like “Long live work”, some just sit on the top of the parliament with their right hand up, as if voting, or ride their scooters. There are the new bus stops (here and here), designed by the leading designer studio of Artemiy Lebedev. There is the new logo of the city, the big cyrillic “P” (? ), embodied in various forms. More than 40 hoardings around construction sites have been painted by artists from all over Russia and abroad. There are the concrete and wooden benches in front of the parliament which, when seen from above, read the word “Power”, or the figures replicating Perm’s famous wooden sculptures that have been installed on facades, or the playful murals. Public art has become present throughout the city, bestowing it an imaginative, creative look (for an especially rich collection of installations, graffiti and objects see http://willby.ru/perm/862-perm-2011-kulturnaya-revolyuciya.html). Perm has changed from being a grey, depressed post-Soviet city into an innovative, interesting place, bursting with life and optimism. It is interesting that the “Perm cultural revolution” was designed to work on many fronts and has not limited itself to visual art and design. Theater and the performing arts have not lagged behind. One of Moscow’s leading theatre directors, Eduard Boyakov, was invited to create a new theatre in the city, one entirely dedicated to promoting contemporary drama. “Putting the contemporary individual at the center of our artistic interest” became the mission of the Stage-Hammer theatre, which did not restrict itself solely to theatre. Film and other art forms, if speaking in a relevant language about the “contemporary human condition”, were incorporated into the program. The Stage-Hammer, which very quickly became popular, initiated the festival “New Drama”, new writing competitions and workshops, and the festival “Textura”, which is interested in the reflection of contemporary life, contemporary characters and conflicts, expressed through all forms of art. The Stage-Hammer theater has become one of the pillars of the “Contemporary cultural revolution” in Perm. “New personages – new audiences”, runs the slogan of the theatre, and it has indeed succeeded in breeding a new generation of theatergoers with taste for contemporary drama and other forms of contemporary artistic expression. The festival offered many art events that were popular in the best sense and fascinated large audiences, such as a Spanish “vertical dance” performed at midnight on the façade of a government building in the center of the city, or the “Carbon City”, a miniature of a society with its own money, theatre, shops, even its own tyrant, whom visitors were encouraged to overthrow in elections. This project attracted a huge audience, with young people (between 14 and 16 years old) queuing up to work as volunteers… Workshops, discussions and master classes supplemented the vast festival program, whose core ambition was to involve the young and old, cultured and not-so cultured people, to encourage participation and creativity, to drag people out of alienation and make them feel part of a community. And yet this is not the end of the story about the Perm Cultural Revolution. With the patronage of the United Russia party (the party of “crooks and thieves” in the eyes of many of Russia’s creative class), the power-tandem of the Perm governor and Marat Guelman have started a strategic initiative that goes beyond the Perm region and is aimed at encouraging artistic developments through regional exchange. The Cultural Alliance, as this initiative was called, has seen several cities subscribing to become members and is growing by the day. The first meeting of the Cultural Alliance took place in November 2011 in Perm, which has become its “capital”. But above all, it strategically affirms Perm as a leader in contemporary cultural policy-making, a shining example that has encouraged other progressive governors from all ends of the country to follow it. One can say that Perm has succeeded in convincing the leadership of several Russian regions that investment in contemporary culture is also an investment in economic and human capital development. The news has spread, and the Perm Cultural Revolution seems unstoppable. And as if all this were not enough, yet another important piece of strategic cultural policy work took place in Perm. Last June, the Perm regional parliament adopted a new cultural policy strategy, designed by the Center for the Development of Cultural Industries, a private cultural policy think-tank based in Moscow. The strategy was aimed at institutionalizing what had already been achieved at the level of cultural practice, and can certainly be qualified as revolutionary in the Russian context, since it puts citizens and their wellbeing at the center of cultural policy philosophy. The idea is to improve people’s lives through encouraging cultural participation and consumption. This is quite a step away from the traditional policy thinking in Russia, which until now has centered on the institutions of high culture and has thus been biased towards cultural production rather than consumption or participation. To my knowledge, this is also the first ever cultural policy concept developed and proposed by civil-society to have been adopted by a government in Russia, which is already an interesting fact. Nevertheless, it comes as no surprise that the “Perm cultural revolution” has not been welcomed by all. Its all-encompassing nature, its ambition to transform the city and everyday life, as well as the fact that everything that is connected to Marat Guelman’s work is unconditionally supported, and – as the rumor goes (because public data is not available) – that this endeavor costs the taxpayers several times more than any other traditional cultural activity, make many people angry. Radical actions provoke radical counteractions: the opposition started with voicing critical opinions in the media, organizing protests against the “replacement of the traditional symbols of Perm by red men” and all the other measures to transform the public space. Artists and citizens proud of their cultural heritage opposed it to the “art of the newcomers”; others sharply criticized the massive regional government investment in – what they perceived as – Marat Guelman’s projects, claiming that it happens at the expense of the rest of the cultural scene. Local intellectuals united in the so-called “Congress of the Perm Intelligentsia” protested against the fact that important cultural decisions are left to Marat Guelman, a newcomer who is alien to the local cultural tradition, and that he has actually become a kind of “grey eminence” of cultural policy-making in the region. Alexey Ivanov, a Permian writer, returned the Stroganov prize awarded to him in 2006 in protest against plans to give the prize to Marat Guelman in 2009… Which did not prevent him receiving the prize, announcing at the award ceremony that he will invest the 10,000 US$ in organizing an exhibition of Andrey Bezukladnikov, a Permian artist living for many years in Moscow. This act was one in a series of wise actions by Guelman targeted towards drawing the opponents of the Perm Cultural Revolution onto his side – a well chosen PR move to show that what he cares about is the local contemporary artistic talent, and the interests of the local audience. But who are the main proponents of the Perm Cultural Revolution and how did they make the “Perm exception” possible? Is Perm exceptional, or is this “culture miracle” possible also in other Russian cities? And what does it take to perform such a miracle? Marat Guelman is a collector of contemporary art, the director and owner of the Center for Contemporary Art (“Guelman Gallery”) in Moscow, the son of the famous Soviet playwright Alexander Guelman; a writer on art and culture who in recent years has constantly ranked among the top five of the most influential people in Russian contemporary art. Many art people would tell you that Marat Guelman is in fact not so much an art person or gallerist as a “political technologist”, a Russian term describing a professional hybrid between a western-style “spin doctor” and a Soviet “social engineer”. And they are quite right: in 1995 Guelman, together with Gleb Pavlovsky, established the “Foundation for Efficient Politics”, a political analysis center which he left in 2002, claiming that it had become too close to Putin, almost a department of the presidential administration. The career of the governor of the Perm region, Oleg Chirkunov, has followed a path typical for many contemporary Russian bureaucrats: technical education, graduation from the KGB academy, during Soviet times membership of the Communist Party, a Komsomol leader. There is, however, a slight deviation: from 1991 to 1994 he worked as an expert in Russia’s commercial representative office in Switzerland. His wife and his sons still live in Switzerland, an arrangement that is becoming increasingly popular amongst the Russian business and political elites. Chirkunov can be thus seen as being familiar with two worlds – the western one, where the core of his private life is, and the Russian one, where business and politics are done. In Russia, he has a retail business. Chirkunov is considered a liberal and a technocrat. One of his main themes in politics is the fight against corruption – also quite typical for today’s Russian politicians and bureaucrats. The enemies of the “cultural revolution” claim that, by profusely funding it, Chirkunov corrupts the Perm cultural scene. It is believed that he was won over for the cause by Vladimir Surkov himself – the ideologue of “United Russia” and, at the time, first deputy director of the administration of the president. Without the Guelman-Chirkunov tandem and their support from the presidential administration, the Perm cultural revolution would hardly have taken off. Experiments of this scale are not easily sustained and would hardly have been possible in the West. If Richard Florida has described the rise of the creative class, and then its flight, then the Perm story could serve him as a source for yet another volume – this time about the social engineering of the creative class, the Russian way. Perhaps both points of view are justified in some ways. However there is one thing that seems to be doubtless: Perm is ripe to become a textbook example of how, in today’s Russia, with all the peculiarities of its regime, and provided the strong state hand offers support, it is possible to create, in a controlled manner, a cosmopolitan cultural space that gets local development moving. All you need is three things: a well-disposed presidential administration, a wealthy and committed regional or local government, and a strategically minded, PR-friendly and influential art figure assigned to manage the process of cultural modernization. It is all so simple, isn’t it? The only question is whether, in the context of the middle class protest against the regime that followed the rigged parliamentary elections on December 4 th 2011, where artists had their role to play, cultural revolution from above will remain an attractive option for Russia’s artists and public alike. Copyright © 2012 by the author & Transit – Europäische Revue.